This short article describes how to make a pair of wooden jaws for a large 4-jaw chuck to make it quicker to turn the side hollows for the Outhollow Ornament. Changing the ornament blank to a new side using the jig described in the OutHollow Ornament article takes at least a minute, whereas with the two wooden jaws it takes about 10 seconds. It also allows you to finish the ends of the finals on lathe. Starting with wood the same thickness as the ornament blank, a pattern is used to cut out the jaws. The jaws are drilled for attaching with socket head screws and a stop block is screwed on. Then the jaws are attached to the chuck and the blank can be mounted for turning. If you use a One-Way Stronghold chuck you don’t have to plan much, because that’s the chuck the Drawing01 is adapted for. If you use another brand of large chuck you have to first measure the separation between the mounting holes for your chuck. It is difficult to measure between threaded holes so I suggest you remove one jaw, and then replace the screws. Measure across the screw heads (from the inside of the inside screw head to the outside of the outside screw head). Then measure the diameter of a screw head and subtract this measurement from the first. That yields the hole separation. Modify Drawing01 for your separation by keeping the first hole mark (nearest the straight edge) and making a new mark reflecting your hole separation. If you have a smaller chuck, but are determined to try making a set of jaws anyway, first open the chuck as far as possible and measure the approximate difference between an opposing pair of inside mounting holes. Subtract 1-3/4” from this measurement. If the result is ¾” or more you may be able to make a set of jaws by moving the inside holes closer to the jaw edge. This is not necessarily a good thing—it depends on how determined you are. Another tactic would be to used an L shaped chuck (a flat semi-circle with the jaw added outside the first mounting hole). This too would be a weaker construction. You must also figure out what size screw your chuck uses (the One-Way Stronghold is a 6mm). You can probably take one of your screws to the hardware store and match it for size and thread. Then buy 4 socket head cap screw that size about an inch long. Print out Drawing01. The pdf version will be most accurate (assuming scaling is turned off in the print dialog box). Find or prepare some wood stock that is 1-3/4” thick (it would be possible to use thicker stock and turn it to 1-3/4” thickness on the lathe). If you like turning with the lathe at as high a speed as possible, use the same wood you will use for the ornaments. Differences in the density of the stop block and your ornament blank may induce some vibration at higher speeds on light lathes. If you would rather save thick hardwood for other things, use glued up pine. Drawing01: Layout of the wooden jaws. Cut up the print out of Drawing01 outside the lines of the jaws. Spray adhesive on the backs of jaw patterns and then apply them to your 1-3/4” stock as in Figure01. If your stock has straight edges, then by all means save yourself some work by lining up the straight edges of the pattern with the edges of the board. Cut out the pieces on your band saw. Fig01: The jaw layout attached to 1-3/4" pine. Select a drill that is just larger in diameter than your mounting screws—you may need a tiny bit of slop to allow for inaccuracies in drilling. I used a ¼” drill for 6mm screws. Clamp a jaw to the table of your drill press and drill with the selected drill where the mounting holes are marked on the pattern as in Fig02. Repeat for the other jaw. Fig02: Drilling holes for the mounting screws in the wooden jaws. Remove the drill and replace it with a ¾” Forstner bit. Put a flat washer on a screw and screw the cap screw all the way into your chuck and measure the distance from the washer laying on the jaw to the bottom of the screw head. Add a little bit (3/32”?) to this measurement so the screws won’t bottom out. Set the depth stop on your lathe so the Forstner bit stops this distance from the table (don’t obsess over this. If you don’t countersink enough, drill a little deeper. If too much, add a washer) and drill a countersink hole centered on the screw hole as in Fig03 (there is room for centering error as the washer is a little less than ¾”). Test attaching the jaw before drill the rest of the countersinks. You should have more than 3 full threads engaged, and should not bottom out in the hole. If you’re satisfied then drill the rest of the countersink holes. The completed straight jaw is shown in Fig04. Fig03: Drilling a recess in the wooden jaws for the washers and mounting screws. Fig04: A competed wooden jaw. Lay out the stop block on the 1-3/4” stock. It should be 1-11/16” wide by 2” long. 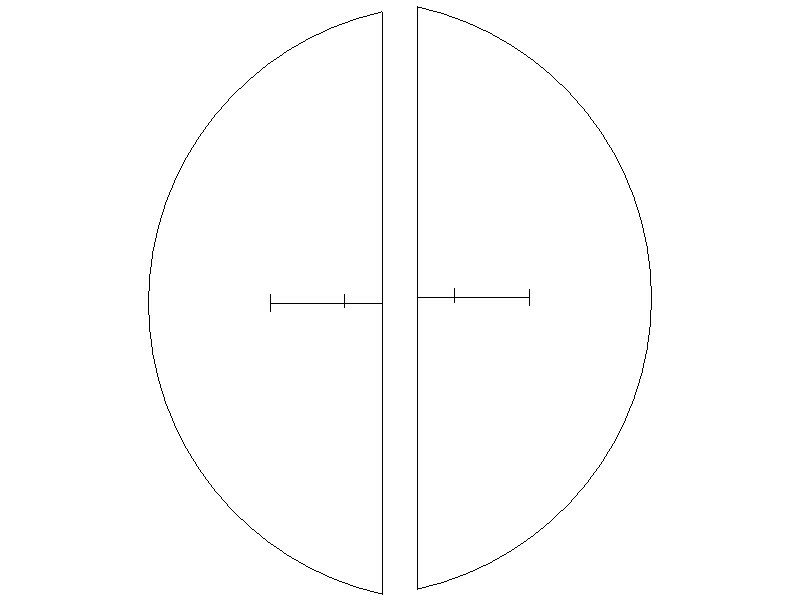 You can use a completed flat jaw to trace a curve on one end as in Fig05. Cut out the stop block on your band saw. The stop block will be attached to the end of one flat jaw with two screws—2-1/2” #8 or #10 will do. Select a body drill appropriate for the size screw and drill two holes through the stop block from side to side. Then countersink for the screws. The completed stop block is shown in Fig06. Fig05: The layout for the stop block. Fig06: After drilling mounting holes in the stop block. Attach the stop block at the end of one of the straight jaws with screws. The completed stepped jaw is shown in Fig07. Fig07: After attaching the stop block to one of the jaws. Remove all the metal top jaws from your chuck. Attach the wooden jaws to opposing sub-jaws on the chuck. Pay attention to the key holes on your chuck so that a key hole will be more or less up when the stop block is away from you and the slot pointed slightly down. Start both screws loosely in a jaw, and then snug them up once both are started. Mount the other jaw the same way. Back off the screws slightly and insert an ornament blank between the jaws. Tighten the chuck so the jaws clamp lightly on the ornament blank—this will help insure the jaws are parallel. Then tighten the screws securely. Loosen the chuck and tighten the screws again. The mounted jaws are shown in Fig08. Fig08: The jaws mounted on the chuck. Mount the chuck on your lathe and it is ready to turn hollows. If you’re feeling compulsive about doing the whole ornament on lathe, after completing the spindle turning you can mount the ornament in the chuck to remove the nubs and sand the finial ends as in Fig09. Assuming you didn’t reduce the diameter to less than the stop block width, clamp the ornament by opposing hollows between the jaws. You’ll have to center by eye in the chuck, but use your tailstock to center in the nub.